Constantinople does not recognize the transfer of the canonical Kyiv Metropolis to the Moscow patriarchate. Constantinople has never recognized Moscow's church authority over Ukraine, Ecumenical Patriarch Bartholomew said during the 40th Day after death memorial service for Metropolitan Evangelos of Perga on 1 July.The head of the information department of the Ukrainian Orthodox Church of the Kyiv Patriarchate, Archbishop Yevstratiy (Zorya), published this message of the Ecumenical Patriarchate's press service on Facebook. "Let us not forget, at any rate, that Constantinople never denounced the territory of Ukraine in any way but the right of ordination of the Metropolitan of Kyiv in Moscow on condition of being elected in Kyiv at the Clerical Assembly and mentioning the Ecumenical Patriarch. This is said in the Tomos on autocephaly that the Mother Church gave the Polish Church: our See has never recognized the secession of the Kyiv Metropolis and its dependent Orthodox Churches of Lithuania and Poland and their attachment to the Moscow Church, which was carried not in accordance with ordinances and without respecting the rights of the Kyiv Metropolitan who had the title of an Exarch of the Ecumenical See," Patriarch Bartholomew said. He said that the Ecumenical See was looking forward to "the restoration of the unity of the divided ecclesiastical body in Ukraine – dozens of millions of believers, baptized and enlightened by the direct care and missionary activities of the Ecumenical See." 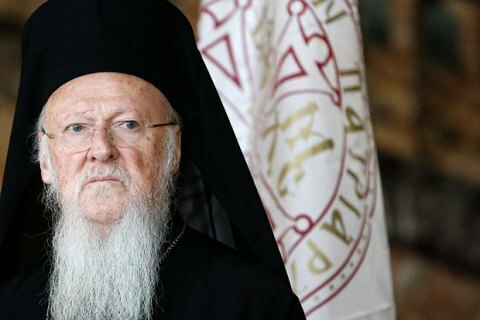 " Ecumenical Patriarch Bartholomew expressed his unwavering interest in the treatment of the Ukrainian ecclesiastical issue and the restoration of the unity of the divided ecclesiastical body in the country. He recalled that the Church of Constantinople, which worked and solved difficult ecclesiastical issues, always in the light of the benefit of the people of God and the preservation of the Pan-Orthodox unity, is still struggling to definitively settle ecclesiastical issues in Ukraine," the message reads.